PhD. 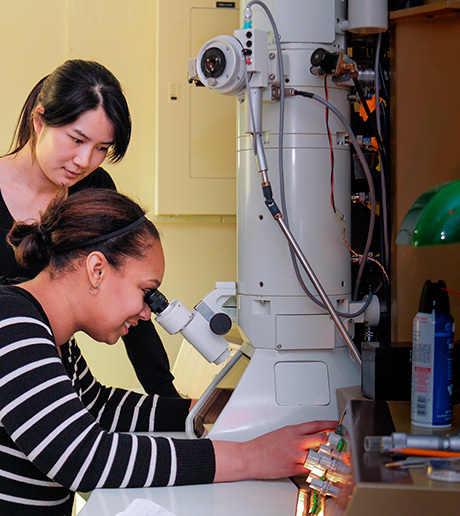 students Alisha Janae Lewis (seated) of Syracuse University and Wenjun Cai of ESF work with an older transmission electron microscope in ESF's Baker Lab, where the new field emission scanning/transmission electron microscope will be located. ESF has received a $1.12 million grant from the National Science Foundation for a new field emission scanning/transmission electron microscope that will be the only one of its kind in Central New York. The microscope will give scientists a new tool to use in research related to human and plant health, nanomaterials, pharmaceuticals, ecosystem health, and the development of new consumer products from renewable resources. The new instrument will be able to examine the nanostructure of biological and non-biological materials and molecules, and perform chemical analysis of complex samples. It will replace a 30-year-old transmission electron microscope in the N.C. Brown Center for Ultrastructure Studies in ESF's Department of Paper and Bioprocess Engineering in Baker Laboratory. According to Susan Anagnost, Ph.D., N.C. Brown Center director and principal investigator on the grant, the new electron microscope will expand the research capabilities of faculty and graduate students at ESF and its partner institutions, Syracuse University and Upstate Medical University. It can be used, for example, by scientists to learn more about protein structure, information that will help with finding ways to treat and combat human diseases. It can also be used by scientists researching the wood cell wall and cellulose nanoparticles derived from wood, and those studying insect vectors of human and plant diseases. Anagnost's co-investigators are Robert P. Smith, M.S., and Ivan Gitsov, Ph.D., of ESF; Stephan Wilkens, Ph.D., of SUNY Upstate Medical University; and Mathew M. Maye, Ph.D., of Syracuse University. Funding for the microscope is also supported by Empire State Development's Division of Science, Technology and Innovation and the three universities. Smith, assistant director of the N.C. Brown Center, said the new unit has applications for both human and plant health. "Diseases vectored by insects such as mosquitoes and flies are deadly to millions of humans as are those diseases carried by aphids and beetles to agricultural products and forests," he said. "Research with this microscope and other new methodology will now allow the ultrastructural examination of vector surfaces as well as the mode of pathogen uptake, internal replication and redistribution of the disease by insects to new hosts." Gitsov, chair of the ESF Department of Chemistry, said the microscope will help researchers learn more about the structure of molecules: "We will gain information about macromolecular architecture and specific arrangement of the building blocks in perfectly branched polymers designed as components of environmentally friendly catalytic processes and advanced drug delivery vehicles." The Wilkens lab at SUNY Upstate is studying the structure and mechanism of biological macromolecules involved in human disease processes. The new microscope with its superior brightness and coherence together with the cryo capabilities (the examination of material at the temperature of liquid nitrogen, more than 300 degrees below zero Fahrenheit) will allow structure determination of the disease-causing protein complexes at a level of detail that will aid with structure-based drug design and discovery. For Maye at Syracuse University, the new microscope means an opportunity to probe nanomaterials with great accuracy. He said the unit will enable researchers to "relate composition and microstructure to performance by visualizing atoms, while at the same time open up additional capabilities by adding cryo-microscopy, where nano-bio interfaces, like those of quantum dots (nanoscale semi-conductors) and proteins, will be visualized and mapped for the first time." Advances in technology enable transmission electron microscopes to do much more than they could even 10 to 15 years ago. This microscope will allow researchers in the greater Upstate NY region to determine atomic or near atomic resolution structures of inorganic materials and biological macromolecules, respectively. Furthermore, not only will the new microscope enable scientists to obtain three-dimensional reconstructions of molecular machines and enzyme complexes, the technology can be used to obtain computer-generated, high-resolution imaging across the sciences. As part of the N.C. Brown Center at ESF, the new microscope will benefit a program that offers a microscopy minor for undergraduates and advanced graduate coursework that includes comprehensive formal training in the theory and application of microscopy. The center routinely provides light, scanning and transmission microscopy demonstrations to community and industrial groups. The new microscope will facilitate interactive, remote access. It will make the center the only local laboratory to offer asbestos identification for the remediation industry.